Karisma Hotels & Resorts and Margaritaville have announced a partnership to develop a collection of all-inclusive Margaritaville resorts. The new Margaritaville, an All-Inclusive Experience, by Karisma will be Margaritaville’s entry into the all-inclusive resort market. While it’s unclear where the first resort is slated to break ground, it will happen later this year with a opening planned for 2018. Karisma currently owns and operates more than two dozen properties throughout Mexico, Latin America, the Caribbean and Europe and aims to have 30 up and running around the world by 2020. Jolly Mon Vacations …destination anywhere. 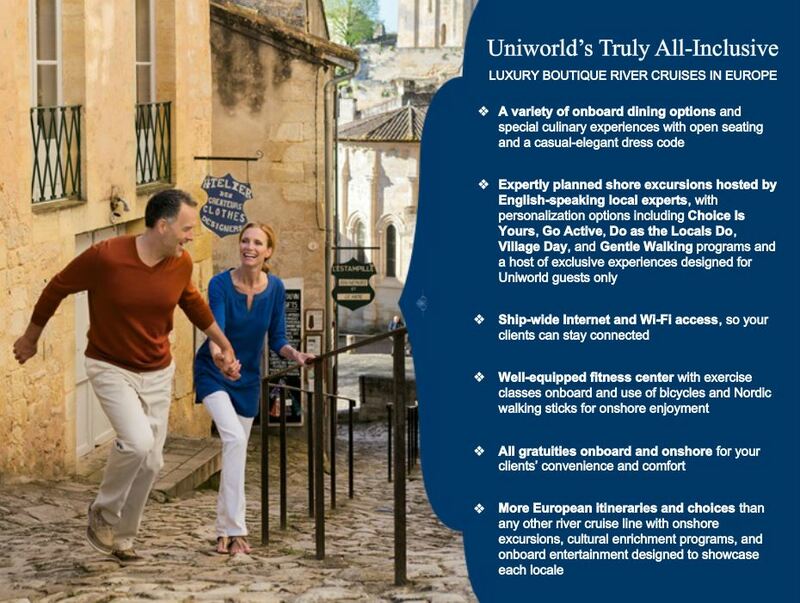 Uniworld Boutique River Cruises is proud to offer themed cruises in 2016 that highlight unique aspects of European culture, as well as family-friendly cruises that allow guests to share the gift of travel with their children or grandchildren. Our NEW Monarch Collection cruises showcase the finer aspects of European royalty. The NEW Connoisseur Collection cruises take your clients on a culinary adventure through France. Good food, wine and friend…what else do you need? 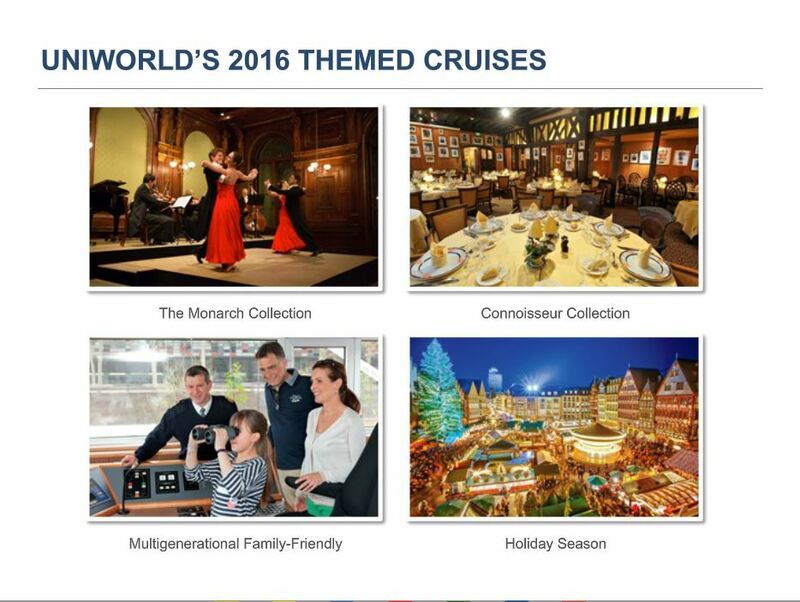 Holiday Season cruises introduce travelers to the magic of Europe at Christmas. It’s no secret that Europe’s Christmas Markets rank among our very favorite river cruises to take each year. The combination of Holiday spirit and old-world charm makes visiting Europe in late November and early December a delight, particularly given that the summer crowds that clog streets, museums and attractions have long since dispersed. Finally, our award-winning Multi-generational Family-Friendly program includes more itineraries and departures than ever before…50% off cruise fare for ages 4-18! Family-friendly shore excursions will keep everyone thrilled. A great bonding experience for the whole family. We specialize in RIVER CRUISING. 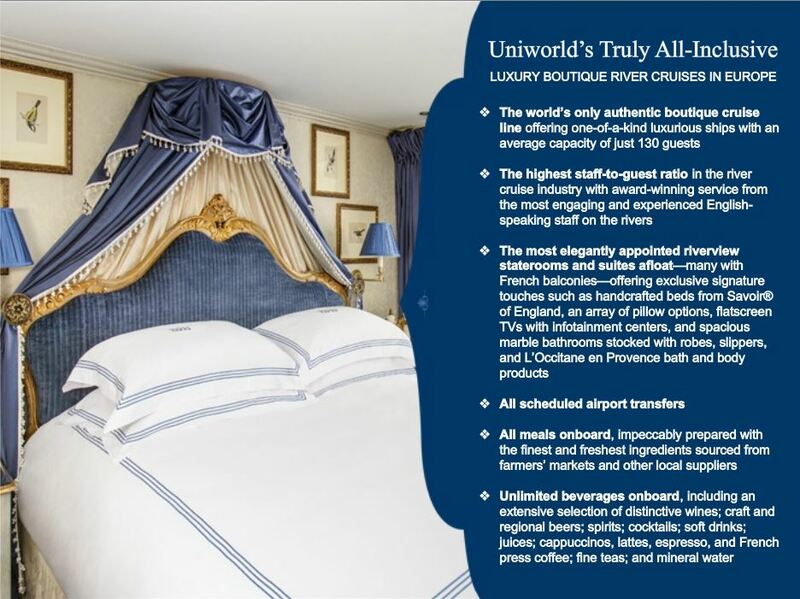 We are certified by the cruise lines and have sailed on the rivers first-hand! Expert advice and NO FEES! We’ll get you the best possible price and value on a cruise that is RIGHT FOR YOU! Anyone can book a cruise…but our experience and knowledge will find you a cruise that matches your travel style.